Mighty Mongoose wants you to enter once for your chance to spend your next winery weekend in the coolest city around! 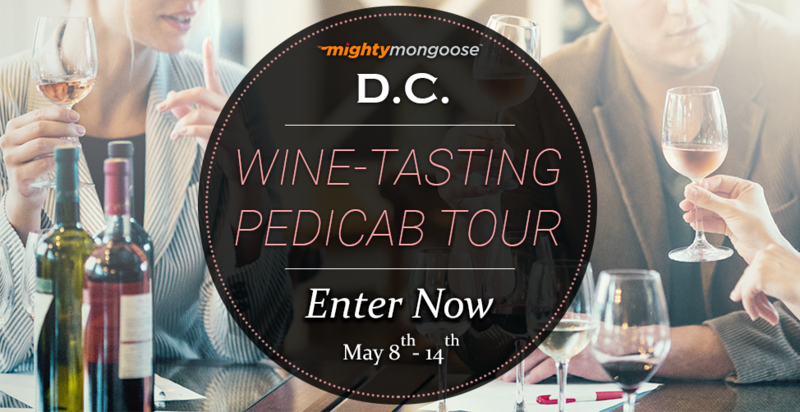 Sit back, relax and enjoy the unobstructed views of Washington, DC on this Wine Tasting Tour of the district by pedicab! One winner gets to enjoy this incredible adventure through historic DC., where you'll delve deep into history and pass through the city's cultural attractions. See all of the sights while sipping a bottle on the go or enjoy the history while being peddled to your wine, champagne or liquor venue tastings! Least we mention this makes for a splendid date night to wow your special someone! Don't forget to enter this bar on the go experience! This Sweepstakes ends on 05/14/16 and you can ENTER ONCE to win.